Situated in a popular residential area offering excellent family sized accommodation over two levels. The property comprises large lounge/diner, kitchen, three bedrooms, with master en suite, and family bathroom. Externally the property comes with off street parking, garage and private garden to the rear. In summary the property layout extends to an entrance vestibule leading to the open plan lounge/diner with French doors to the rear garden. To the rear of the property, off the dining area the fitted kitchen comes well stocked featuring, floor and wall mounted units, integrated gas hob, oven and hood. Further benefits include a large storage cupboard. The upper level houses three good sixed bedrooms, and a family bathroom. The master bedroom features an en suite shower, and each of the three bedrooms also benefit from fitted wardrobe space. 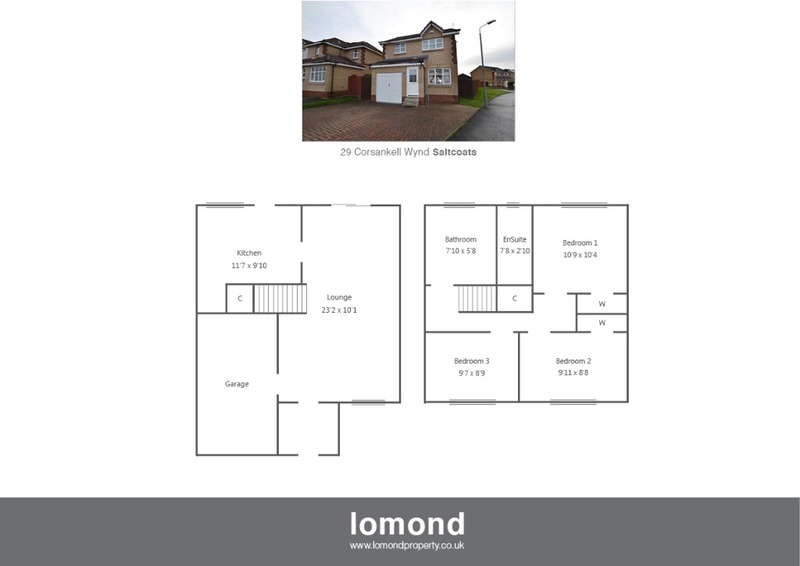 Externally the property is located on a large corner plot. To the front there is off street parking for 2-3 cars, and a garage. To the rear the garden is laid predominantly to lawn with raised timber decking ideal for summer dining. The property benefits from gas central heating, and double glazing throughout. Corsankell Wynd is an established and popular residential area. Saltcoats town is close by and provides access to a range of amenities including supermarkets, bars, restaurants and town centre shopping. There are a number of local primary and secondary schools within the greater 3 towns area.